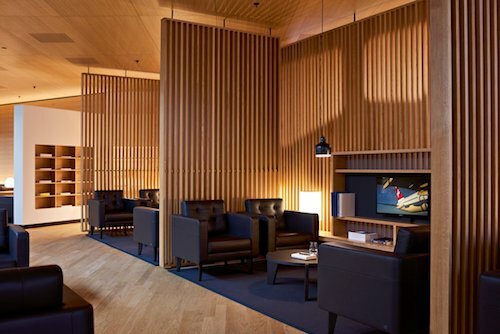 The SWISS First Class Lounge opens at Zurich Airport today! The new lounge features an a la carte restaurant, a bar with a wide range of Swiss grappas, an on site barista plus check in facilities and its own security checkpoint. The new lounge, located in Terminal A is accessible via an escalator from the departure concourse and is styled in the signature SWISS First Class look. The 650 square metre lounge includes lounge suites, a lounge club with leather sofas, a business zone and meeting room with views over the airport apron. Zurich First Class Lounge, leather lounges. An a la carte restaurant is available for guests as well as self serve food and beverage options, with the centrepoint of the lounge being the bar with over 100 Swiss Grappas as well a variety of specialty coffees. A smokers’ lounge with its own outside section and a choice of fine whiskies is also located in the lounge. 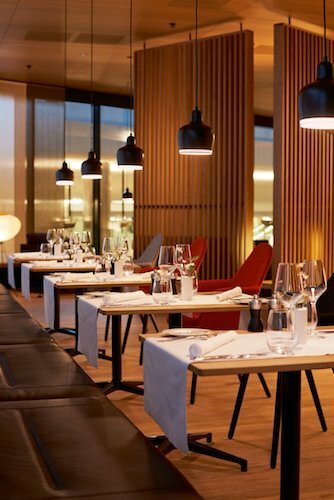 A la carte dining in the new SWISS Zurich First Class lounge. Located in terminal A, the new lounge is predominantly for passengers departing on short haul flights, a limousine transfer to the lounge at Terminal E is available for those travelling to long haul destinations and the airline is also introducing a chauffeur service to first class passengers arriving in Zurich, picking up to from the aircraft door and delivering directly to the relevant passport or security control. Passengers can check in at the welcome desk, drop off registered baggage and pass through a dedicated security checkpoint. To book your SWISS first class tickets contact our expert Airfare Consultants.